When your son heads out to play a links course, the 1st thing you both need to pay attention to is the weather. 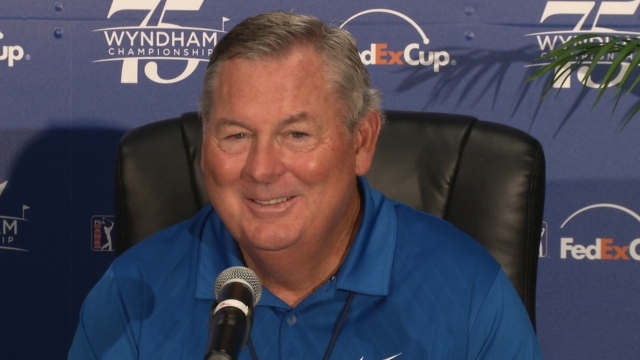 Dry means the course will play as designed and wet means lower scores because the only defense the course has is wind, terrain and hazards when it is wet. It does not play as designed, it plays much easier. 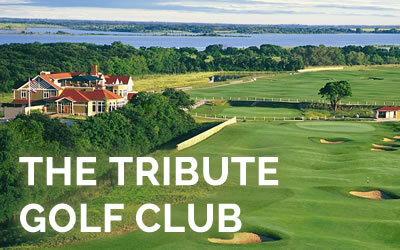 S3’s college team has played in a tournament this year and the previous 3 years at the excellent Tribute Golf Club in The Colony, north of Dallas on the shores of Lewisville Lake. When the course is dry and hard, it plays as designed with lightening fast fairways and greens. Your son would not dare put an approach shot above the pin as his downhill putt would likely roll off the green if he didn’t make it. The Tribute is a tribute to 18 of the most legendary links holes in Scotland and each hole has a plaque telling its history and it is most interesting. Folks, this is a great golf course, a wonderful golf course and if you are in the DFW area I heartily recommend your son and you too, play it. In Texas, we don’t complain about rain because we never know the next time we’ll get some. As fate would have it, it has rained cats and dogs every year just a few days before this event. What does that mean? It means the course is pretty much defenseless and there will be some low scores. Players can shoot right at the pin because the greens are holding and are way slower than they are supposed to be. So links golf creativity is reduced and taking dead aim at the pin is in play. Really, the guys like to make birdies, but I know they were relishing the challenge of playing on a true links course with it’s fangs bared. So let’s look at S3’s final round last Tuesday. It’s a beautiful day with temps in the 60’s at tee time and rising to the mid-70’s, mostly sunny with light winds. And the course is still wet. So this means the guys can treat this round as a regular US-type golf course rather than a links course and shoot at the pin. Now there are some intimidating holes on this course, 1 particular stretch on the front 9 comes to mind, so there aren’t just gimme pars because it’s wet. Welcome to links golf, sort of. S3 had his chances to be under par. If he had putted as he did the day before he would have been at least 1-under. Dad and Mom this is golf. This is for college golfers, junior golfers and us adults too. What worked yesterday may not work today. And some of what worked yesterday may be even better today. I mean, S3 in his round of 75 hit 11 of 14 fairways (78%) and 15 of 18 greens (83%). These are great numbers! Really the difference between this 75 and being under par is 1 poor drive, 1 poor chip, 4 3-putts and 2 additional missed short putts. Ya gotta love this sport! In this Wednesday Waggle we are going to investigate a name which may be new to you and your daughter, links golf. Basically there are 2 types of golf courses, links and traditional, for lack of a better word. So what does links golf mean to your daughter? Links golf courses are the original golf courses, formed along coastlines in Scotland where there is rolling sandy terrain and lots of wind. Links courses require creativity because when they are in proper condition, meaning dry and extremely fast fairways and greens, your daughter must use different shots and strategies to have a decent score. On most holes, the greens are so hard and fast she cannot land her ball on the green, but must roll it to the pin. This means a lot of fun, seeing the contour of the ground along the desired path and then rolling a low shot snakeing towards the hole. It is very exciting and fulfilling to watch the shot she visualized actually end up where she had hoped. So your daughter will get great experience on how to handle windy conditions. 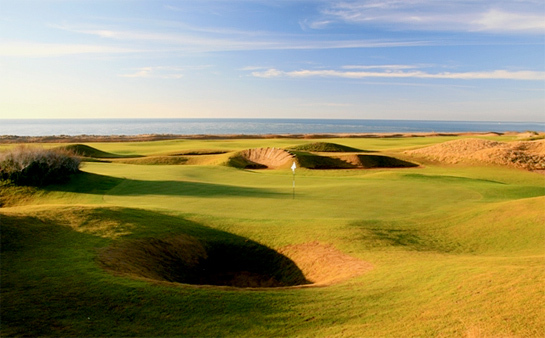 Links golf courses: rolling, undulating, fast fairways and greens. Few, if any trees. Very difficult rough. Pot bunkers. Cannot land ball on green, or at least anywhere near the pin. Lots of wind. Great fun and an opportunity to really engage and enhance your junior golfer’s creativity. Find a links course near you and take your daughter to go play it. Make sure the course is dryed out and fast. Don’t go right after a big rain. The course will not reveal its true self when wet. Golf is more of an art than a science. Every shot is different and creativity is a big part of playing good golf. Get creative with your daughter. Book a round on a links course today. In today’s Monday Mulligan we are taking a look at another vital, but often ignored or taken for granted piece of golf attire, caps and visors. Yes, indeed, there is more than 1 reason virtually every professional golfer wears 1 of these. A visor is my preference on warm to cool weather because for me there are times a cap is just too hot. Be aware that it is totally possible for your son to get a sunburned scalp when he wears a visor. And some kids will wear either and some kids absolutely cannot stand visors and just won’t wear them. So look for quality in the construction: nice feel to the fabric, decently thick headband, quality adjuster, not the cheap plastic strap with holes and probably a synthetic material. The lightweight colorful cotton caps are only good for 1 sweaty wearing and then they look terrible and you can’t fix them. 1 more thing and you don’t find this often and I don’t know why: look for a dark underside to the bill. This allows your son’s eyes to relax a bit more as it reduces glare. Really it makes a big difference. Many fishing hats have this feature and it is 1 of our favorite cap and visor characteristics. There are youth sizes and adult size. Be sure you know what your son’s size is before spending any money. 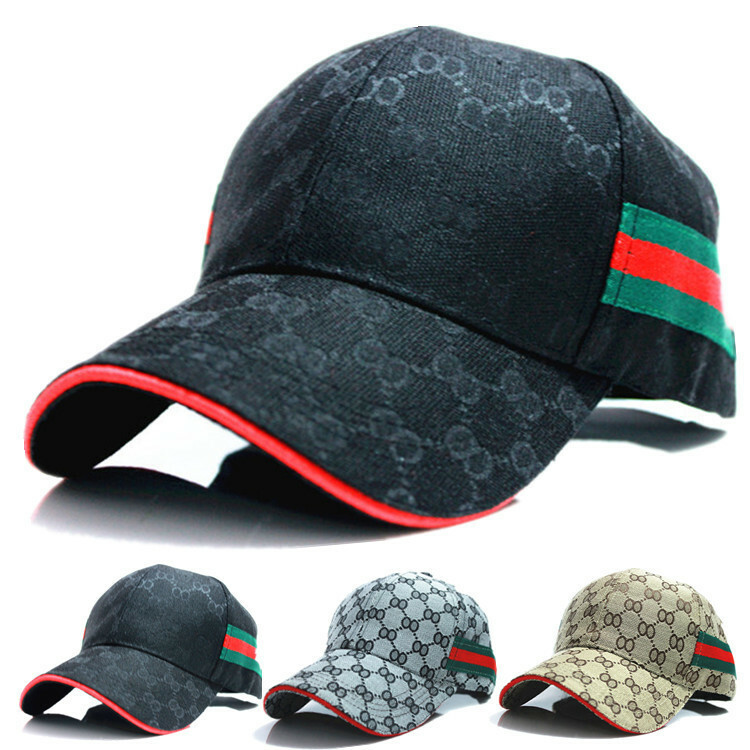 1 more thing: just because a cap or visor has a big-name golf logo on it doesn’t mean it is top quality. And just,because someone want $29.95 for it doesn’t mean it is top quality either. Mom and Dad beware. And yes, we believe that yours son and every golfer should wear a cap or visor. They are essential. Yes, we are talking about the shot clock, the pace of play clock, the out of position clock, the slow play clock, the taking too long to hit a shot clock, whatever you want to call it, you know where we are going here. First, Mom and Dad, know that my comments here about the slow play of girls is not an attack on your daughter, but statements of facts learned by years of being around the situation. There are surely boys who play slowly and S3 has had plenty of them in his groups over the years. This being said, S3 never takes more than 22 seconds to hit a shot and usually the other young men play quicker rather than slower. 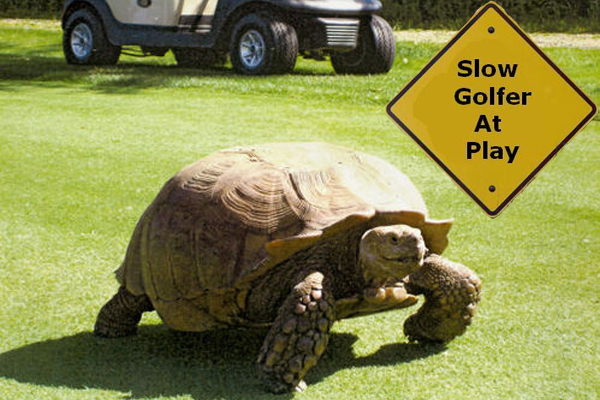 Girls golf however, is notorious for horribly slow play and the main reason is that the girls have been allowed to get away with slow play because of a lack of manpower in junior and amateur golf, not enough rules folks/marshals to maintain proper pace of play. The scary line is, “Guys you are behind a 4-some of high school girls.” The common response is, “Oh no, 6-hour round.” Walking to the clubhouse in 1 high school tournament, I saw 4 high school female golfers all kneeling down studying the lines of their putts. Not 1 player moved and I walked nearly 300 yards in the meantime. This is nuts, but happens a lot, at least here in Texas. Nobody likes being put on a clock and almost nobody plays well when they’re on the clock. Henrik Stenson has been on the clock at least twice in PGA events and both times, no matter how well he was playing before, he made several bogies until his group was back in position and taken off the clock. Don’t get put on the clock. The pressure is terrible. There are some additional subtleties to this situation and I recommend going to the usga website and reading the rule together with your daughter. Knowing the rules is a requirement and if your daughter knows them better than her group members, she has a big advantage. In today’s Wednesday Waggle we are taking a look at time, as in the clock and it’s importance in junior golf. This reminds me of some of the great rock songs: Time Has Come Today -The Chambers Brothers, Time (Is On My Side) – The Rolling Stones and Does Anybody Really Know What Time It Is – Chicago. Great music, great memories, great relevance. 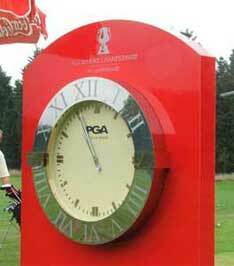 Now that your son is at the course, a 2nd, more serious clock comes into play and that is the clock for his tee time. There are 2 ways of starting his round: a shotgun start where multiple groups start at the same time on different holes and there may be as many as 2 groups per hole, an A & B group. The tournament director will tell them either to wait until they hear a horn to begin play or that they can tee off as soon as everyone has arrived at his hole. Nobody has much chance of being late for their start as this is a fairly casual, effective way to start an event. The 2nd way he will start a tournament is with tee times. This is where being on time is critical. If his tee time is 9:00:00am and he shows up 1-second late, he is late and is penalized 2 strokes. If he is 5 minutes or more late, he is DQ’d, disqualified. S3 and I were at #1 tee at a junior event and he was in the 2nd group in line. So we’re watching the current group hit and a boy comes up and the starter informs him he is late and is penalized 2 strokes. Well, his Mom went livid and ran over to Grandpa and starting chewing him out. She had gone off somewhere and had given him instructions on when to get the boy to the tee and Grandpa lost track of time or such. Tee times are serious business. Treat them accordingly. Starting a round off with a par is a good thing. Starting with a 2-stroke penalty sets a horrible tone for the rest of the round. See you on #1 tee, on time… Sam. 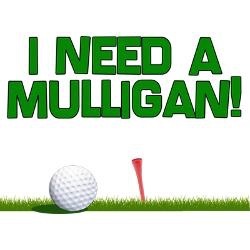 In today’s Monday Mulligan we are going back, back to basics. In golf as in life, the basics are where everything starts. The greatest athletes in all sports will tell you that your son must master the basics if he is going to have success. There is 1 more part of setup and this is the 1 that gives all golfers, including the pros, a fit. Alignment, yep getting your son’s body in position to start his shot on his desired path so the ball ends up where he wants it to be. This is so very basic and critical to hitting successful shots, yet Golf Channel announcer and World Golf Hall of Fame member, Lanny Wadkins, during his coverage of the Champions Tour event here at our beautiful TPC San Antonio Canyons Course this past weekend, said that “every professional golfer struggles with alignment at some point in his career”. Wow! Does that say something about how easy it is to set up incorrectly? 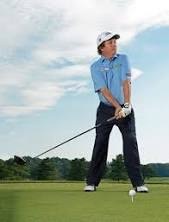 For tee shots, approach shots, chips or putts, keep that head still. Video your son with your phone, give him a visual. This approach works. It makes it real. Yes, the pros struggle with the basics just like the rest of us. They, however, spend hours on the range getting back to good basics. Something you and your son should keep in mind. When you suggest checking parts of his setup, you may get a response such as, “it’s fine” or “I checked that the other day”. Well, ask him to please check it again right now, particularly if his shots are off. There are times our kids just don’t want to revert back to basics, they just want to swing at all those range balls. Dad and Mom remember, practice without purpose is at best just a social event or at worse, a waste of time. In today’s Friday Flop Shot we will look at the other emotions that show up on the golf course and that is the emotions of the parents. Your daughter’s emotions are those we think of 1st, but Dad and Mom’s emotions are equally, if not more, important. The best rule of thumb for parents is to be very respectful of the rules and when in doubt keep your mouth closed. One of the struggles for many young golfers is maintaining focus, which is not helped by excessive parental chatter. Now this is coming from the Goldfarb Family which is made up of 100% talkers, so please don’t tell me how tough this is to do. We know. We all pretty much understand how your daughter is impacted when, after making a good shot, you, the parents, give her positive response. But what happens when she hits a poor shot, chunks a chip or misses a 3-foot putt? 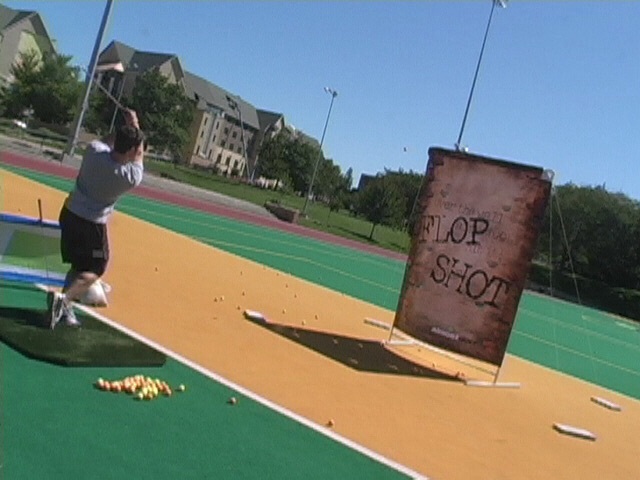 Bad shots are when the parents can have the most impact on the junior golfer. Parents, you must smile, say that’s OK, we love you, give a thumbs up. You cannot drop your head, slump your shoulders, look depressed and walk away, period. This destroys your child. The last thing she wants to do is disappoint you. And you must convey that she never disappoints you, that your love for her is not measured by the numbers on her scorecard. Yes, we parents feel our kid’s pain when they hit a bad shot, but we can’t show it! 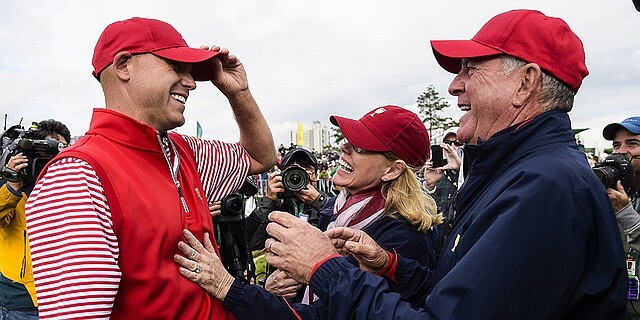 So we had a parent/child scenario in The President’s Cup when US Captain Jay Haas used 1 of his Captain’s picks to select his son Bill. Now Bill was like 11th in line and only the Top 10 spots are guaranteed, so Bill was very close to making it on his own. I’m proud of Jay for picking his son. The choice wasn’t looking that great as Bill teed off in the LAST, 12th match in the Sunday singles. Here was Bill Haas, having a 0-1-1 record, not very good, playing in the final match of a 4-day event, that was going to be extremely close, and the whole world was watching. What do you want to call this on Jay’s part? Bad strategy, foolish or good faith and confidence in his son. I choose the latter.